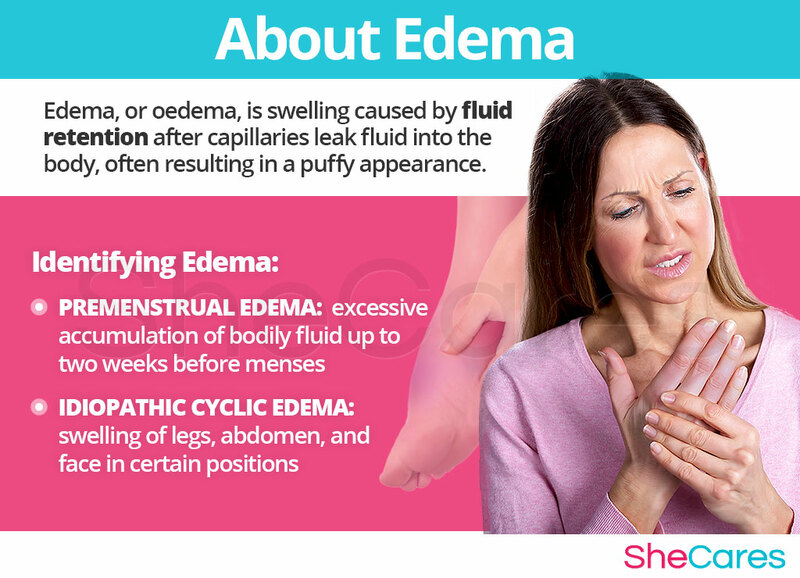 Edema is a swelling condition caused by fluid retention, which can leave a woman feeling achy and tender. There are many different types of edema, but the ones most commonly associated with hormonal changes in women are idiopathic edema and premenstrual edema. Some women suffer from extreme forms of these conditions, which can severely affect wellness and self-esteem. Fortunately, there are steps a woman can take to prevent or manage edema, in all stages of life. Continue reading to learn everything about these types of edema, their causes, signs and symptoms, and treatment options. It is estimated that approximately 4.4 million people in the U.S. suffer from edema. Idiopathic edema may last from a few months to around 25 years. Around three quarters of women experience some sort of edema during pregnancy. 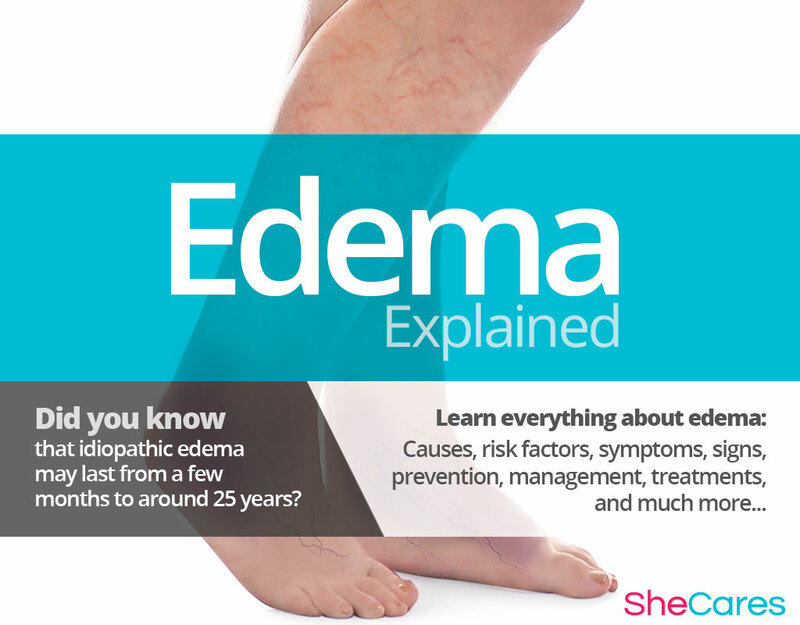 Edema, or oedema, is swelling caused by fluid retention after capillaries (tiny blood vessels) leak fluid into the body, often resulting in a puffy appearance. The location or nature of the swelling can be an indicator of the type of edema a person is suffering from, and of its underlying cause. Edema can be caused by a variety of different underlying conditions, and the swelling symptoms can manifest in a variety of different ways. However, edema in women is often a sign of a hormonal imbalance. Hormones levels fluctuate naturally on a cyclical basis to instigate changes in the menstrual cycle, but even a slight hormonal imbalance can lead to a variety of unwanted symptoms, which together compose premenstrual syndrome (PMS). 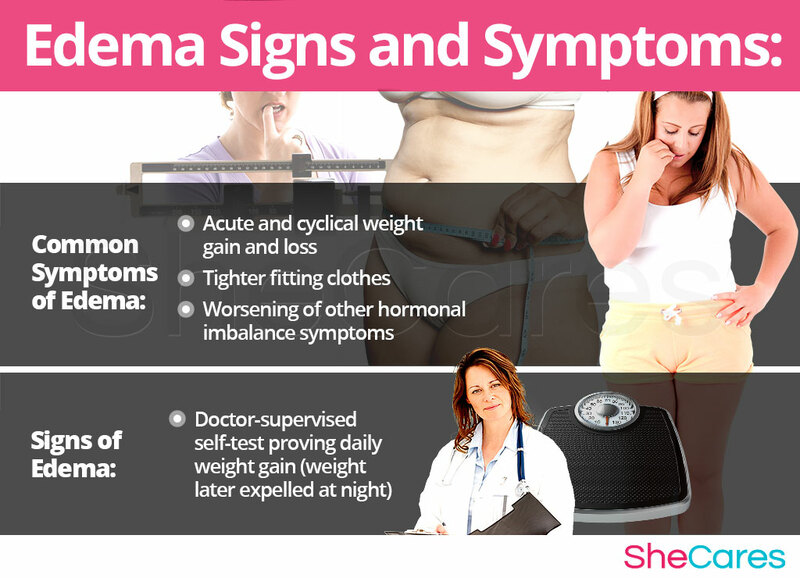 Premenstrual edema is just one of these symptoms. Women will also experience larger hormonal shifts during important reproductive life stages, such as puberty, pregnancy, post-partum (including breastfeeding), and menopause. Imbalances during these phases can lead to a plethora of symptoms, including idiopathic edema. Although there are many types of edema, there are two forms which are particularly relevant to a woman's reproductive life. Learn more about these and other types of edema by reading on. Although there are many types of edema, there are two that are relevant to and more prevalent in women. The first is premenstrual edema, whereby women experience swelling on a regular basis tied to the menstrual cycle; and idiopathic edema, a more severe swelling condition more common in young women, likely linked to imbalanced hormones. Other types of edema that may be caused by underlying conditions include peripheral edema, eye edema (periorbital, macular, or corneal edema), cerebral edema, pulmonary edema, lymphedema (swelling in the lymphatic system) and angioedema (rapid swelling under the skin). If symptoms other than those described in this article appear alongside swelling symptoms, it is advisable to seek the advice of a healthcare professional to rule out any serious diseases and receive a diagnosis. Keep reading to discover the various causes of edema in women. In order to be able to treat the condition, it is important to recognize and understand the causes behind edema. Although the exact causes of chronic edema in women are not entirely understood, most doctors and researchers believe that the main cause of idiopathic and premenstrual edema is hormonal imbalance, especially because these are more prevalent during women's reproductive lives. However, other types of edema can be caused by other factors and serious medical conditions, so it is important to distinguish between them. Continue reading to learn more about both the hormonal and additional causes of edema. Hormones are chemicals produced in the endocrine system, which relay signals between cells and organs in the body. They control myriad processes in the body, so when hormone levels fall out of balance, disorders such as edema can occur. Many cases of edema in women are primarily caused by the hormonal changes in a woman's body. During the menstrual cycle, progesterone levels slowly decline to a lower level than estrogen to trigger menstrual bleeding. Although this estrogen dominance happens naturally in the final days before menstruation, medical researchers have found that extreme symptoms of PMS, including premenstrual edema, are caused by abnormally high proportion of estrogen to progesterone during this time. Like with PMS, women are more likely to experience edema during phases of considerable hormonal imbalance in reproductive life - puberty, pregnancy, post-partum, and menopause. The hormonal changes during these stages stimulate the production of aldosterone, a steroid hormone excreted by the adrenal glands, which encourages the re-absorption of sodium and water back from the kidney into the blood stream, increasing blood volume. This results in fluid leaking out of the capillaries into the intercellular space causing swelling, or edema. Thus, if hormone levels are not harmonized, women may experience extreme swelling symptoms, as well as other symptoms of hormonal imbalance. Although hormonal imbalance is a common cause of edema, each reproductive life stage has distinguishing hormonal features that, combined with other factors, can result in the development of edema in women around PMS and during puberty, pregnancy, post-partum, and menopause. Puberty is when a girl's body begins producing the hormones that will lead to body changes and menstruation. These hormonal factors, added to other reasons such as poor diet or allergies, combine to explain the occurrence of edema during puberty. Pregnancy is a stage that involves radical changes in hormone levels in order to accommodate body changes, support the fetus, and prepare for childbirth. These hormones combine with other factors, such as compression or preeclampsia, to increase the risk of edema in pregnancy. Post-partum is another stage where hormones change rapidly to prepare for breastfeeding. Edema is common due to these hormonal changes, along with other factors such as post-labor swelling or breast engorgement. Menopause signals the end of a woman's fertility, and is marked by a period of declining hormone levels. Hormonal fluctuations are one reason for edema in menopause, but factors such as weight gain can also influence this symptom. While hormonal imbalance is the one of the main causes of edema in women, in severe cases edema could be the symptom of a more serious medical condition. Please read on to learn more about the other possible causes of edema. Other types of edema can have other underlying causes. Sometimes it is not easy to distinguish between edema caused by hormonal imbalance, and edema caused by kidney disease, thyroid disease, or diabetes, for example. As a general rule, if the swelling has a sudden onset, is localized (i.e., swelling in one leg only) painful, or accompanied by symptoms such as dizziness, difficulty breathing, confusion, or chest pains it is important to seek emergency medical assistance. Some women are more prone to develop certain types of edema than others. Keep reading to learn about the risk factors and triggers for developing edema. The likelihood of suffering from edema increases when a woman is also affected by certain psychological, behavioral, and health reasons, such as a history of affective disorders, being overweight, or consuming too much salt. 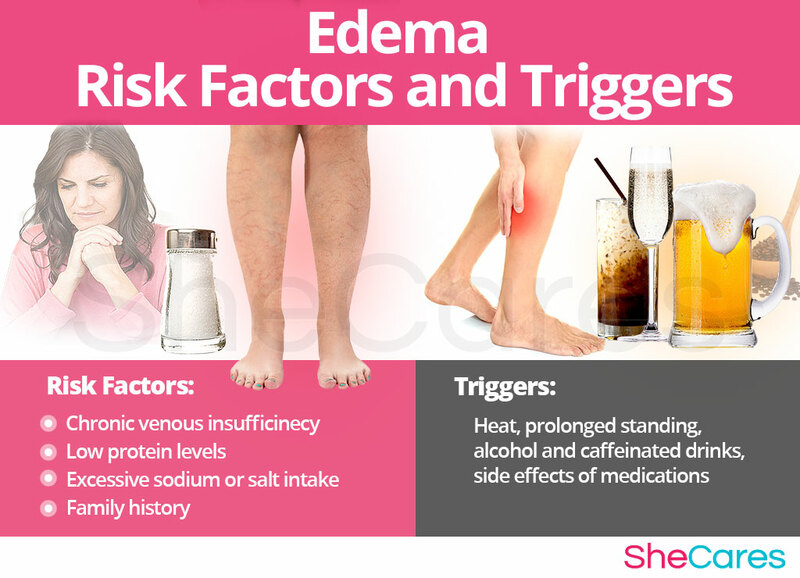 These risk factors are highly significant in the development of all types of edema, and increase the chances of a woman developing edema during her reproductive life. Other, more immediate triggers can also induce sudden-onset swelling symptoms in sufferers of idiopathic edema. These triggers can be environmental or behavioral, such as a hot environment or prolonged standing, and in avoiding them it is possible to reduce the frequency of swelling symptoms. It is important to recognize the different symptoms and signs that point to edema, to be able to choose a treatment specific to the cause. Continue reading to discover the symptoms and signs of edema. All types of edema have swelling in common, but each type of edema has very different sets of symptoms to identify it. However, edema has many common symptoms that most women experiencing the condition will notice. In addition, there are other symptoms that a woman will experience with idiopathic edema that are not found with premenstrual edema, other than the sporadic nature of episodes and the visible shifts in swelling over the course of the day, such as headaches, puffy features, and frequent nighttime urination. Because the cause of idiopathic edema is unknown, there are few medical signs which will alert a healthcare professional to the condition. Added to the fact that the symptoms can be mild or go unnoticed for long periods of time, this means the condition may go undiagnosed. Although episodes are periodic and common in women, idiopathic edema has no relation to the menstrual cycle. On the other hand, premenstrual edema is characterized by acute weight gain before menstruation due to water retention, but there is no fluid retention at any other point in the menstrual cycle. Currently the only medical sign of idiopathic edema is a weight gain of between two to four pounds over the course of the day (which is then expelled at night). A doctor may ask for a patient to do a self test, by weighing themselves naked and before having eaten in the morning and then 12 hours later in the evening. A daily weight gain of two to four pounds is indicative of idiopathic edema. A doctor will want to determine whether there is an underlying cause of the edema, especially in the cases of heart disease and kidney failure, the two most serious causes. In identifying signs and symptoms in order to diagnose edema, a doctor will usually review the patient's medical history, and perform a psychiatric assessment and a physical exam. The doctor may also decide that certain tests are necessary. Although most women put up with edema without considering treatment, occasionally the condition can morph into another more severe disorder or illness. In this way, it is important for women to consider treatment options. However, most forms of edema with long-term symptoms do not require hospitalization. These rare complications of edema can include cellulite, rheumatism, and heart and kidney problems. These complications also have specific warning signs. After the initial assessment, a doctor may perform further tests to confirm a diagnosis. It is essential to learn more about the management and treatment of idiopathic edema, if diagnosed. Read on to learn more about how to prevent or manage edema in women. Although there is no single way to prevent edema, women who employ certain prevention techniques may decrease their likelihood of developing edema symptoms. These actions should be taken in advance, even before the first signs of idiopathic edema develop, to avoid the need for invasive treatments later on. The best prevention methods are changes in lifestyle, with regard to diet, exercise, and healthy habits. Supplements are also an excellent way to complement these lifestyle changes and enhance the endocrine system, helping to reduce edema symptoms caused by hormonal imbalance. If edema has already appeared, these prevention methods might not be enough to keep this disorder from reoccurring. However, there are many ways to manage the condition in order to reduce the severity of its symptoms. Continue reading for management tips for edema. Whether a woman is experiencing edema as a symptom of PMS, or its cause is unknown, there are many management tips available to cope with the swelling and other symptoms. These general tips, along with daily changes to routine in order to avoid triggers, will make a huge difference to women suffering from edema. Such tips include elevating extremities, keeping hydrated, and avoiding extreme temperatures. Edema can also be managed by alternative treatments. Although they do not tackle the hormonal cause behind edema, they may be useful in reducing swelling symptoms at the current moment in time. Massage and acupuncture are two examples of alternative ways to manage edema. All of these management methods are valid ways of making edema bearable for women who suffer from the condition. However, they do not treat the hormonal imbalance at the root of edema. Thankfully there are many natural treatments available to treat this condition; please read on to discover these edema treatments. Because there are so many types of edema, the type of treatment approach recommended depends on the type of edema a person has, and in some cases, the severity of the condition. However, it is more than possible to find an effective treatment for edema. This section provides an overview of the treatment options for idiopathic edema and premenstrual edema. Three levels of approaches can be considered for treating edema. These are categorized as: (1) Lifestyle Changes, (2) Alternative Medicine, and (3) Pharmaceutical Options. Although these approaches can be used interchangeably, it is recommended that women begin by making small changes to lifestyle, which is the least invasive treatment option. These changes go some way to reducing edema symptoms, the benefits are multiplied when combined with herbal supplements or other alternative medicine. Finally, if these measures are not enough to treat severe cases of edema, some women may resort to prescription medications. 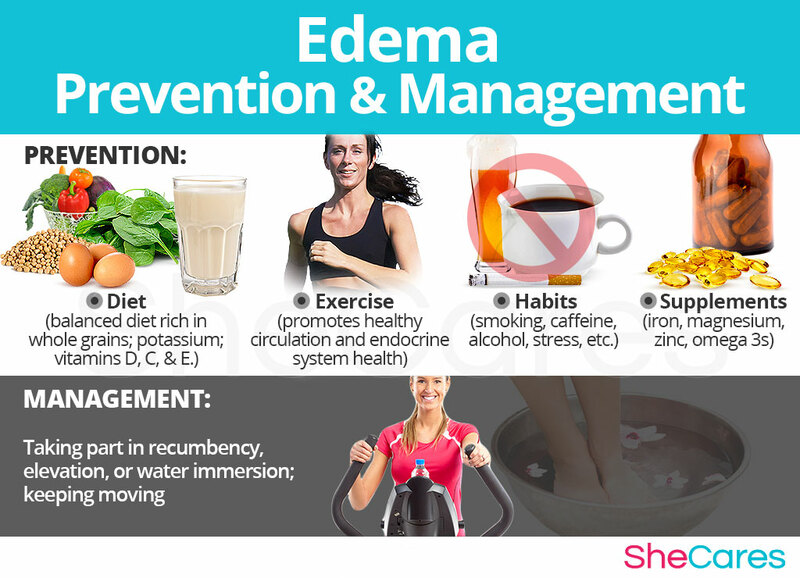 Making healthy lifestyle changes is the best first approach to treating edema, because it is the least risky and least expensive. These changes often have a huge positive impact on women's overall health, improving conditions caused by hormonal imbalance, such as edema. Making dietary changes, increasing physical activity, and developing healthy habits are all important lifestyle changes to consider. These healthy changes will help reduce edema symptoms, but in order to address the underlying hormonal imbalance, women may need to supplement their diet with alternative medicines. These are an excellent way to regulate hormone levels in a safe and natural way. 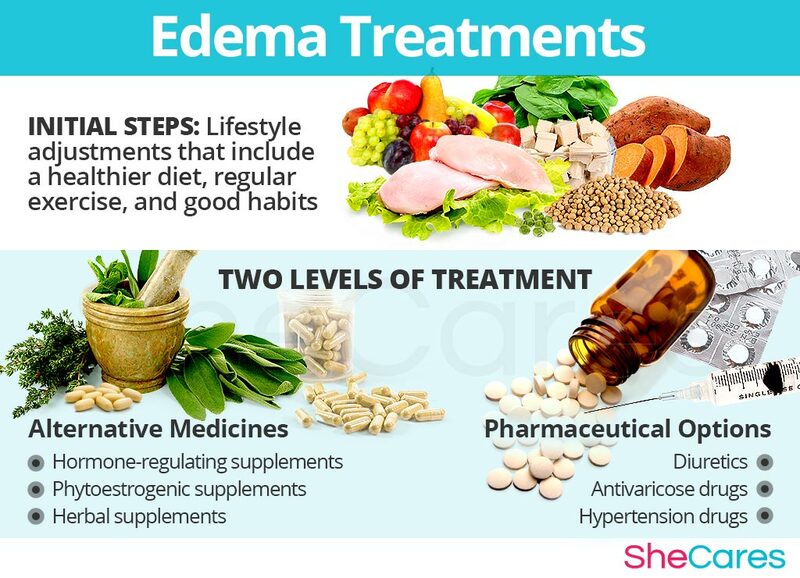 Most women find that alternative medicines and supplements are an extremely effective way to treat edema. In the case of herbal supplements, there are two main types that can be used: phytoestrogenic and hormone-regulating herbal supplements. These supplements, such as black cohosh, contain plant estrogens that, when introduced into the body, mimic the activity of natural estrogen. They can be used to treat estrogen deficiency. While these herbs may be effective for women in menopause and others with low estrogen levels, they may not be suitable for women with hormone-related edema, since those types of the disorder are caused by an excess of estrogen. These supplements, including Macafem, nourish the endocrine glands to promote natural hormone secretion and support the system as a unit. This directly treats imbalances and has an effect on all hormones produced by the endocrine system, not just estrogen. These supplements can be considered one of the safest and most natural ways to treat edema linked to an underlying hormonal imbalance. Since they stimulate natural hormone production, they can be taken throughout a woman's lifetime. Other herbal supplements and multivitamins may also reduce edema symptoms, or at least make them more manageable, such as vitamin B supplements and ginkgo. A combination of approaches is usually the most effective route to take. Lifestyle changes combined with alternative medicine will most likely be the best way to alleviate the symptoms of edema. While this approach works for many, others will find that they want or need to go to the third level of treatments. Prescription medications should be the final recourse for women suffering from edema caused by hormonal imbalance. This is because the treatments are usually the most expensive and the riskiest; some of these treatments have side effects of their own, which have an even more negative effect on women's health and wellbeing. Drugs prescribed for idiopathic edema in women can include diuretics, stimulants, and hypertension and antivaricose drugs. These three approaches can be used by a woman in different combinations and at different times depending on her unique combination of symptoms. However, many women are finding that their hormone-related edema can be combated through changes in lifestyle and habits, combined with herbal supplements or other alternative medicine. Blackburn, S.T. (2009). Maternal, Fetal, & Neonatal Physiology: A Clinical Perspective. 3e. St Louis (MO), Saunders Elsevier. Dunnigan, M. G., Henderson, J. B., Hole, D. & Pelosi, A. J. (2004). Unexplained swelling symptoms in women (idiopathic oedema) comprise one component of a common polysymptomatic syndrome. QJM: An International Journal of Medicine, 97 (11), 755-764. doi: 10.1093/qjmed/hch126. Pereira de Godoy, J. M. (2010). Remission of Hypnic Headache Associated with Idiopathic Cyclic Edema with the Use of Aminaphtone. The Open Neurology Journal, 4, 90-91. doi: 10.2174/1874205X01004010090. Pereira de Godoy, J. M. & De Fátima Guerreiro de Godoy, M. (2011). Evaluation of the Prevalence of Concomitant Idiopathic edema and Cellulite. International Journal of Medical Sciences, 8(6), 453-455. doi: 10.7150/ijms.8.453. Pinals, R.S., Dalakos, T.G. & Streeten, D.H. (1979). Idiopathic edema as a cause of nonarticular rheumatism. Arthritis & Rheumatism, 22 (4), 396-399. doi: 10.1002/art.1780220413. Ziomkiewicz, A., Ellison, P.T., Lipson, S.F., Thune, I. & Jasienska, G. (2008). Body fat, energy balance and estradiol levels: a study based on hormonal profiles from complete menstrual cycles. Human Reproduction, 23 (11), 2555-63. doi: 10.1093/humrep/den213.